A beautiful thing you can do for yourself is go on a solo journey. 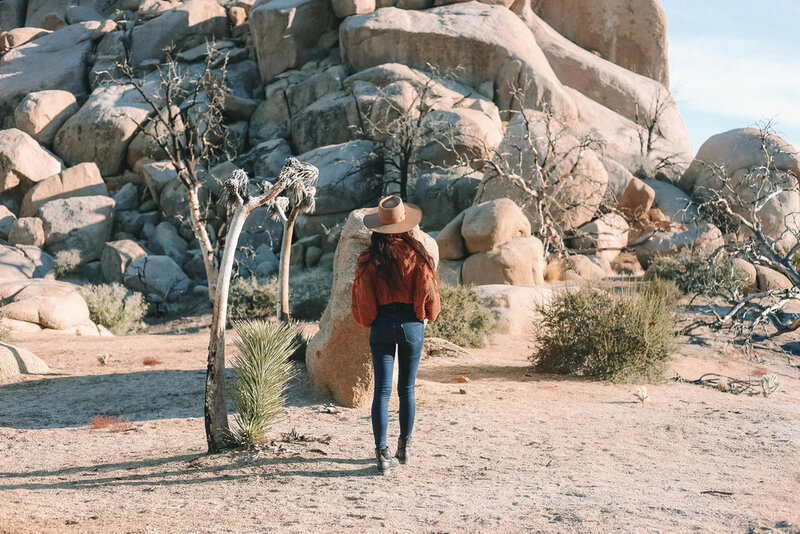 I have been to Joshua Tree before with my family and instantly feel in love with it. I returned to California to surprise one of my best friends on her 30th birthday. It was so thrilling to surprise someone in that way, it was a simple act of doing something for someone else. On this trip the one thing I wanted to do was return to the desert and I knew it would be a solo trip. Solo travelling is so healing, especially in the magnetic desert. 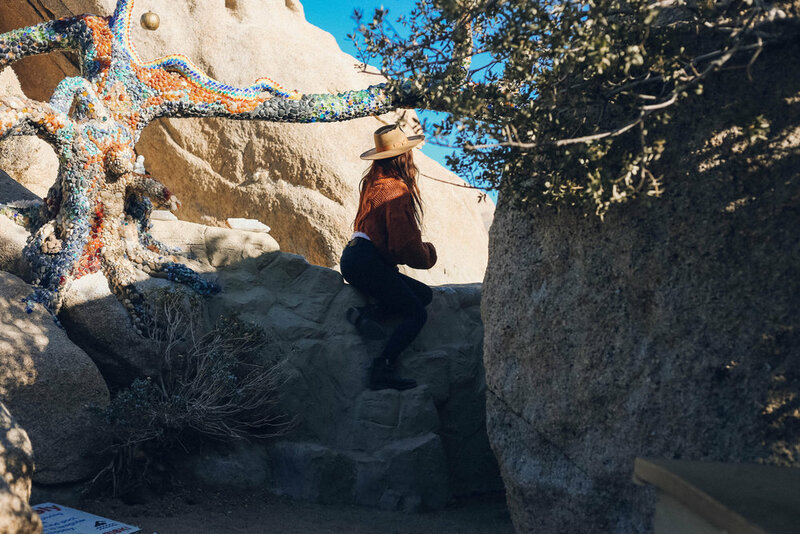 My friend told me about a really cool place near Pioneertown called Garth's Boulder Gardens. It was a little hidden off of many dirt roads and no cell service. But once you find it it is so worth the journey! 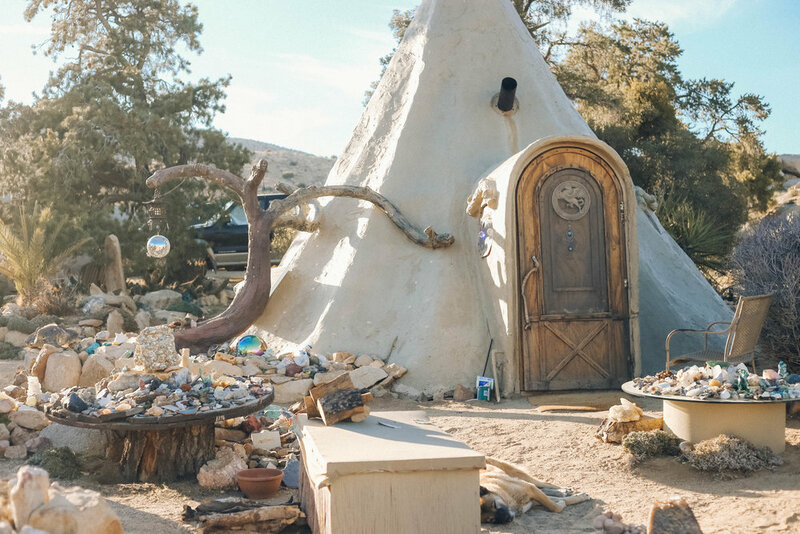 It is this artistic sanctuary created by Garth who lives in a solar powered teepee structure. Once you arrive you are greeted by a friendly crew of desert dwellers who asked me if I wanted to meet Garth after introducing me to their goats. I walked into Garth's home and met the man that created the vision for this place. He was kind and generous, sitting on what looked like a throne and playing me a dvd of orchestra music. After that introduction I went on my way to explore the rest of the sanctuary. There were crystals everywhere, beautiful structures and even a man made pool and sauna. It was such a unique place that you have to see to believe. 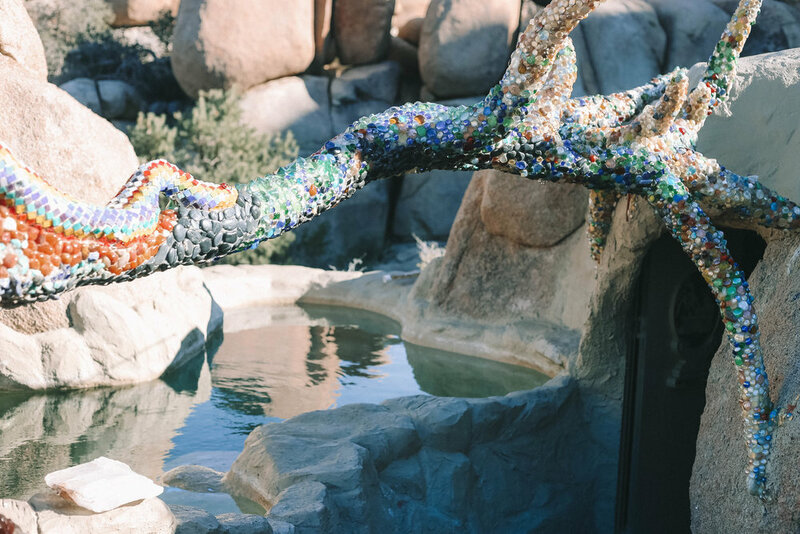 Taking this little trip reignited my goals, my dreams of creating my own thriving business and brand and my dreams of creating beautiful film projects. You can hear yourself more clearly on a long solo drive, kinda the same way meditation works. And when you are in a new location, especially one that fits your likes and aligns with you so well you can really start to see what is possible. As much as happiness and joy comes from within, I truly believe environment plays a huge role in how you feel. Putting yourself in a new vibration that feels right for you will only elevate you to match that vibration. That is how I felt in the desert, like oh this place feels familiar, this is the kinda place I should be in or at least close by to. Find that place for you and watch how amazing experiences start to enter into your life. It may take a little while for me to return, but when I do I will be living close by! Also the beautiful sweater I am wearing is from a shop in LA called The Canyon. It was gifted to me by my dear friend, something I believe I manifested for the photos I took in the desert!